Garrett 1167700 Magnascanner MT 5500 Walk-Through Metal Detector FREE SHIPPING! The Garrett MT 5500 metal detector provides maximum throughput with multi-dimensional scanning. The MT 5500 metal detector is easily assembled with only 4 pieces and 8 screws. Features multi-dimensional scanning which ensures maximum throughput and uniform screening with a minimum of false alarms. Multiple coil circuitry with dual alarm lights inform operators on which side of the detector the target is located. With "hot spots" eliminated, the unit's detection field is uniform throughout the archway and false alarms are minimized. State of the art microprocessors ensure sensitivity and flexibility of programming with a maximum of 200 distinct sensitivity levels in each program. Audible alarm with 3 distinct tones indicating target on the left, right or center of the archway; two LED bar graphs related to the red Alarm Lights that report detectable metal on either side of the unit or centered within it. Unique coil design of the Garrett MT 5500 offers multidimensional detection field with uniformity both horizontally and vertically. This design, plus a choice of three levels of ankle level boost, eliminates traditional hot spots and weak signals. 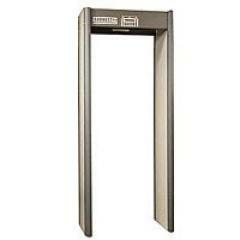 ©2002-2019 CopsPlus.com: Garrett 1167700 Magnascanner MT 5500 Walk-Through Metal Detector FREE SHIPPING!